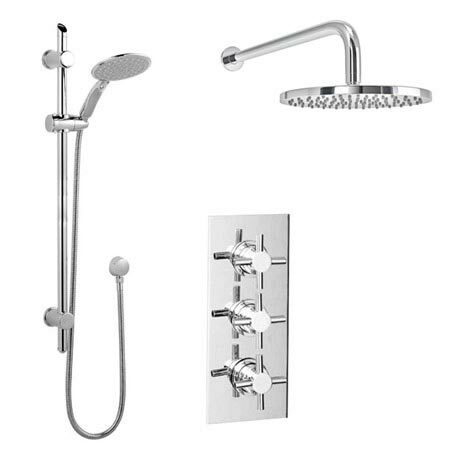 A quality modern complete shower package ideal for renewing the style of your bathroom affordably, comprising of a triple shower valve, round wall mounted shower head and a slider rail kit. The minimalist Pablo triple concealed thermostatic shower valve brings substantial elegance to the modern bathroom. This stylish concealed thermostatic triple shower valve offers thermostatic showering via three easy-to-operate controls. Separate controls for temperature and flow. Operates two shower accessories separately or simultaneously. Slider rail kit features a sliding rail, shower hose, outlet elbow and shower head. The 200mm round wall mounted fixed shower head with arm offers a chic minimalist look that feels great in any setting. Supplied with round outlet elbow. Hi, flow rates are as follows 0.1 BAR, 6.1lm. 0.2 BAR, 6.7lm. 0.5 BAR, 8.1lm. 1.0 BAR, 11lm. 2.0 BAR, 14.8lm. I hope this is some help! Q. Does the large wall fixed shower head swivel at all? Hi, the Pablo Triple Thermostatic Valve features a shower head which is on a swivel joint. Thanks.